Splurging on store-bought beauty products or making regular trips to the spa may sound appealing, but it can get so expensive! Why not whip something up in your own kitchen, which is just as effective and costs a lot less? Plus, the ingredients are all natural, with no harsh chemicals. 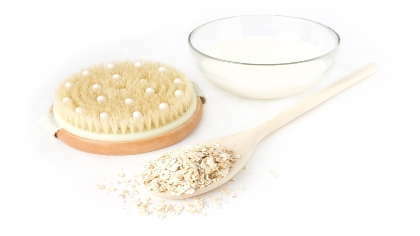 Mix together ½ cup oatmeal (plain oatmeal, cooked first), one egg, and one tablespoon of almond oil. Spread it all over your face and leave it on for 15 minutes. Rinse with warm water. Combine 3 parts sugar to one part olive oil. If you want a scented scrub, add several drops of your favorite scented oil such as lavender or rose hip. This scrub helps moisturize and remove dry skin on your face or body. Mash an entire avocado and apply it to dry or sunburned skin. The inside of the avocado peel can be used for moisturizing, as well. Just rub the peel on your face and rinse after 15 minutes. Beat an egg yolk until it’s frothy. Add one teaspoon of baby oil and one cup of water. Massage into hair. Leave on for a minute or two and then rinse with water. You can also mash an avocado and mix it with some coconut milk. Comb this mixture through your hair and rinse after 15 minutes. Whip 1/2 cup coconut oil until it is the consistency of frosting and use with a cloth to remove makeup every night. This can also be used as a body moisturizer. Melt 1/3 cup shea butter and 1/3 cup virgin coconut oil in a small saucepan over low heat. Remove from the heat and transfer to a heat-safe bowl. Add 1/4 cup jojoba or sweet almond oil. Mix well. Refrigerate until solid and then whip until light and fluffy. Spoon into a jar and keep in a cool, dry place. Puree one ounce orange juice, 6 strawberries, ½ apple, and ½ pear. Before using, spread a thin layer of honey on your face, followed by the fruit blend. Rinse after 30 minutes. Melt ¼ cup beeswax. Remove from heat and add ¼ cup castor oil and two tablespoons sesame oil. Then add beet juice until you achieve a desired color. Melt 3 tablespoons grated, unbleached beeswax and 5 teaspoons of either sunflower, castor or jojoba oil together in the top of a double boiler, stirring often. Remove from the heat and add 6 drops of fruity scented essential oil and 1 teaspoon honey. Mix thoroughly. Pour the mixture into a container and let sit for 20 minutes before covering or moving. For a shinier lip balm, use 2 teaspoons wax and 8 teaspoons carrier oil.